Ping Pong is April 39ers’ Extreme Sport! April 1: If you claim to be a toddler 39 years ago … who are we to question it? Surely you recall this day when our favorite long-running TV station, Nickelodeon, hit the airwaves? Well, to be fair, it had been broadcasting for a couple of years as the Pinwheel Network. The name was easier to spell, but not as charming. Rebranding to Nickelodeon paid tribute to the first five-cent movie theaters of the early 1900s. Wow. Even I wasn’t around back then. Apr 13: Remember ping-pong? 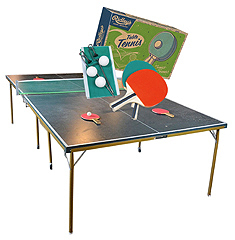 Yes, it’s still around, and is even an Olympic sport, but game snobs call it table tennis. Back in the day, though, it was the family game for spring and summer. No self-respecting game room or garage was without a big ol’ green table. Speaking of family, the Guinness Book of Records (as it was known until 2000) says an April 1979 ping-pong match still holds the longest doubles record. Sacramento, California brothers Phil, Lance, and Mark Warren with friend, Bill Weir, spent 101 hours knocking that little white ball around! Now that makes it an extreme sport for me. Aries (March 21st – April 19th) turns its spirited, energetic attention elsewhere mid-month, as we welcome reality-based Taurus (April 20th – May 20th) to help us celebrate Earth Day (22nd). The down-to-Earth sign guides us firmly into the rites of spring. Have you ever noticed that both Sun Signs feature horns? 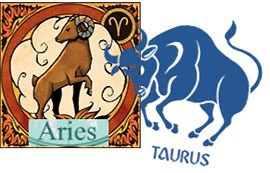 Hmmmm … says a lot about free-thinking Aries the Ram, and stubborn … I mean, practical and steadfast … Taurus the Bull. Shopping for birthday gifts? Red flows dominantly through the Aries psyche, whether they know it or not; and of course, Earth green with tinges of golden brown falls into Taurus’s healthy spectrum. But it’s the clarity of the lustrous diamond that will capture the attention of both, as April’s glittering gemstone. Laugh, love and live voraciously, because you’re the oldest you’ve ever been and the youngest you’ll ever be again.